Sample products made using plastic and coal ash from ponds and landfills. Researchers at North Carolina A&T University have developed the composite building material and hope to eventually have it replace wood in some construction. 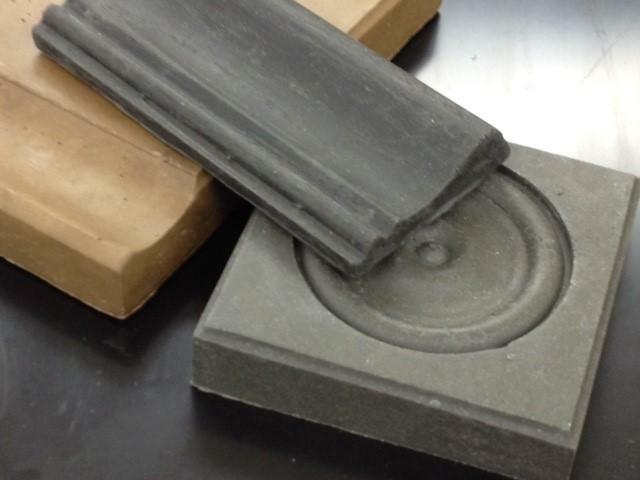 Researchers at North Carolina A&T University have developed a composite building material using plastic and coal ash from ponds and landfills. Smooth "fly ash" has long been used in concrete. But until recently, the wet, uneven stuff in coal ash ponds and landfills hasn’t been useful – and it’s leached and spilled harmful substances into waterways. Chemist Wade Brown says A&T's new coal ash polymer could be used to replace wood in construction, particularly in railroad ties and on utility poles. Brown says the beams are cheaper than wood since coal ash waste is free, and the material is more durable. Another advantage: supply won't be an issue either, according to Brown. Hundreds of millions of tons of coal ash are sitting in ponds and landfills in North Carolina alone. Brown says there's much more in other states, and new coal-fire power plants are being built in other countries. "There's plenty of ash. It'll take several generations if we used all of it quickly,” he said. “The amount of ash isn't a problem." A&T Engineering Professor Kunigal Shivakumar says this coal ash composite doesn't burn, rot, or attract bugs. Nor does it require frequent chemical treatment as wood does. While a wooden beam on a utility pole might last 25 years, Shivakumar hopes to demonstrate one of these composite beams will last 60 years. Researchers are finishing UV exposure and durability testing and hope to find a manufacturer for high-volume products soon. Shivakumar projects this coal ash polymer will be used in utility poles and railroad ties within the next year or two.